‘The Goat Parva Murders’ is a very entertaining and quirky cozy mystery. It’s populated with many very colourful characters who are a delight,even if some of them are a touch creepy. Our investigative heroes are Inspector Knowles and his sidekick Barnes. They have their hands full trying to make sense of things in Goat Parva, that’s for sure. Julian Worker is a wonderful writer. There’s sharp observation of detail, loads of tongue-in-cheek humour, and an ingenious and imaginative plot. The story bounds along and drags you with it, with lots of action and excitement. This is a super piece of writing, one of those indie gems that make you so grateful for the ebook revolution. 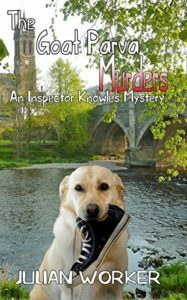 Posted in Book reviews, Cozy mystery, Fiction, Kindle.Tagged British mystery, cozy, quirky.